Retirement assets are all different. You can’t just call retirement assets “pensions.” Pensions are a very specific type of retirement asset that are kind of old school that the big companies used to have in the past where you didn’t really have an account with any value in it. You were just told that when you retire, you’re going to get a stream of income every month of a certain amount. It’s called a “defined benefit plan,” which means you get a certain benefit when you retire, but there’s no money in the bank in your name. It’s all in a big account for all the employees of the company, and the employer promises to pay you this stream of income when you retire. That’s very different than the more modern 401(k) account, which is what most people have now. That’s actually an account in your name that’s your money, and you can take it when you leave and you can do what you want with it. There are taxes and penalties if you take it before you retire. The Public Employees Retirement System (PERS) in Oregon is what teachers, police officers, and any public employee receives that is sort of a hybrid type of account. Now there’s a portion of PERS that is sort of like a 401(k). It’s actually your own account, but there’s still also a portion of PERS that is a defined benefit that’s like an old pension, and you receive a certain amount each month when you retire. You’ve got to be very careful in dividing assets to really understand retirement assets. 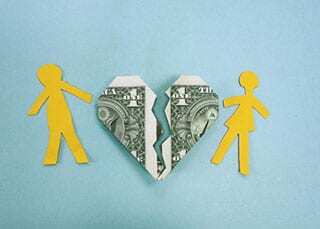 How much are the retirement assets really worth in divorce?